Back in 1999 with a $100 budget (cost for a domain name for three years), Tim Storm, Founder and CEO of FatWallet, started an online coupon community. 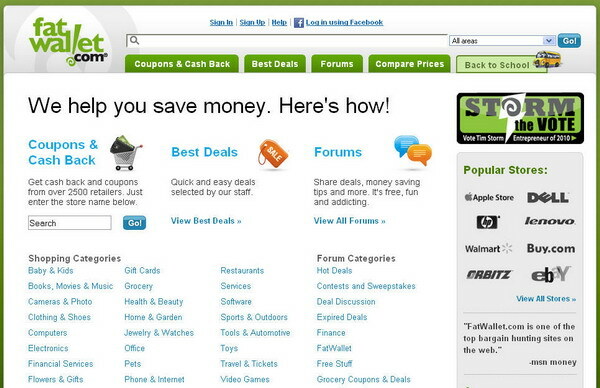 It was originally presented as a forum for people to share coupons and deals. The concept quickly grew into a savvy online community where members not only shared coupons and deals, but all kinds of helpful consumer information including shopping tips, scam alerts and personal investment advice. Today, FatWallet is also a popular online resource for millions of shoppers to compare, share and find thousands of the latest deals, coupons and retailer discount offers. FatWallet saves consumers money by giving back some of their affiliate revenue in the form of cash back (over $28 million). 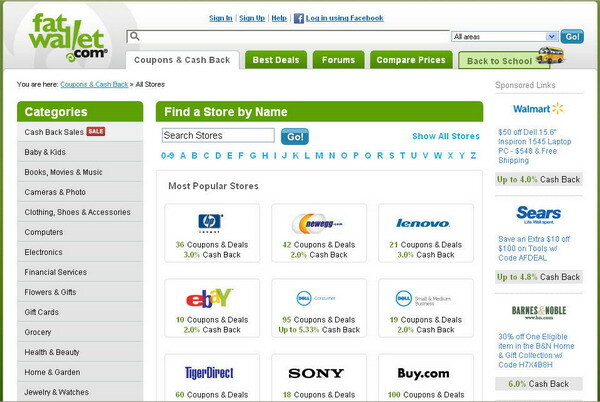 FatWallet has also facilitated over $1.2 billion in purchases for its merchant partners since 2005. FatWallet ranks as one of the top 1,000 websites according to Compete.com. Tim is currently one of four finalists for Entrepreneur of 2010 by Entrepreneur Magazine. The contest, which ends Sept. 10, features the finalists’ profiles where visitors can vote to choose their favorite entrepreneur. Tim is also on the board of the Performance Marketing Association which gives performance marketers a unified voice to address government legislation and regulation, and shape policies that impact online marketers. Was FatWallet your first business? If not, can you tell us a bit about where you first tested your entrepreneurial chops? Yes, FatWallet was my first business. However, throughout my prior employment experiences, I had touched all of the general business aspects; from product ideas, to design, to manufacturing, to retail. So, because of those prior experiences, I was able to have a good understanding of how the whole system and process worked, which gave me greater insights on what it takes to run a business from start to finish. Deals and coupon sites are very popular now, but I cannot remember seeing any in 1999. Where did you get the idea/inspiration to create FatWallet? Did you plan on it becoming a business? Back in 1999, you’re right, there weren’t a lot of coupon sites. There were some. When I would do a search online, the sites that I would find were either not up-to-date, or they were not done professionally. Since my background gave me the experience and knowledge to create the website, I said, “This is something I can do in my spare time.” I also saw that there was a lot of power in creating a third-party endorsement for products and businesses. So, having that third-party nature and being a trusted source was important to the development of FatWallet. While originally it was seen as a hobby and something I could do to help people, it was pretty clear within the first few months that, with the scale that we were able to connect with consumers, it could be a real business. In fact, 10 months after I started the company, I took it on as my full-time job. FatWallet drives a lot of traffic (and sales) to partners. Can you tell us a little bit about the technology that runs FatWallet? What has been the biggest technical challenge you’ve faced running FatWallet? From a technological point of view, we run on the LAMP stack, which is Linux, Apache, MySQL, and PHP. It didn’t start out that way. When the site first started we were on a shared hosting environment, running on ColdFusion. One of our largest early technical challenges was growing beyond what that initial infrastructure, running on one server and running on that platform, could handle. So, needing to react to a platform that was not dealing well with the load demands and being able to react to that and moving to a different technology platform in a very short period of time, with very limited resources, was our most difficult challenge, technologically. The challenges that we face today are probably bigger in terms of dealing with a much larger scale; however, we’ve got a lot more resources, knowledge, and infrastructure to be able to handle that. You clearly are heavily involved and successful in online marketing. You’re sitting on the board of the Performance Marketing Association. How do you compare Performance Marketing versus Branding? Do you create brand value at the same time when conducting performance marketing? If so, how do you measure the value of your brand? Realistically, the difference in how I would compare performance marketing versus branding is that performance marketing is only getting paid when we create results for the advertiser. It certainly can create a branding experience, and that is a bi-product of it, but for us, if it is not creating sales for the merchant and generating revenue for us, then we are not going to continue to promote that merchant, so there is no branding in that case. So, unless it is something mutually beneficial, there aren’t going to be any branding opportunities. There is no free lunch in this regard. Either we are creating sales for the merchant, or it is not going to live on the site. Recently, there have been tons of deal and coupon type companies popping up. One major example that comes to mind is Woot. How do you compete with all these new-comers? I don’t think that we are philosophically opposed to what any of the deal and coupon sites are doing. As long as they exist to serve the consumer, they’re not really our enemies – they are our competitors. By nature of being a competitor, it just gives us a way to find out how good we can be and use the collective minds that we’ve put together on our team and see what we can do to continue serving the consumer in new and better ways. We continue to invest heavily in innovative, new ways to serve the consumer to the best of our ability. What stops a race to the bottom between you and your competitors in terms of offering more commission to consumers? There have been competitors who have jumped in and offered higher commissions than what we choose to offer. More often than not, it is something that happens for a short period of time, just like a sale at a retail establishment. What it comes down to is: We are very efficient in the cost structures that we have associated with supporting our customers. We know what it costs to be able to send out a check and process PayPal payments and we’ve been able to minimize those costs. We do it as efficiently as anyone can. We know that there are limits to what a company can offer in cash back and still be a viable business entity. So, while we’ve seen companies enter the space and offer more, they don’t last because it is not something that is viable, long-term. We’ve held our own and we’ve continued to offer a fair percentage back to our consumers, in addition to offering the highest level of customer service (we are highly regarded by our consumers for this). We also see that through our strong customer retention and customer satisfaction scores.